Attendees will be responsible for arranging their own accommodation. No block of rooms has been set aside. A list of hotels within the vicinity of NCWCP can be found here. Please note that the distances specified for hotels in the link are relative to University of Maryland Main Campus and not to NCWCP. We have arranged with the NCWCP cafeteria (Kloud Café) to supply boxed lunches and refreshments during registration, morning and afternoon breaks. These can either be purchased in a package, or a la carte. Visitors to NCWCP must show a valid Government/State ID at the entrance. Some State IDs are considered Non-Compliant for U.S. Federal Government building access. A list of those States and options for other forms of Government IDs and information are listed https://www.dhs.gov/real-id. From Maryland: Take I-495 East to exit 23A (Kenilworth Ave/MD-210 S). Stay on 210 South until you make a right onto River Rd. Take the 1st right onto University Research Ct. The NCWCP will be the building on the left at the end of the court. From Virginia: Merge onto I-495 OUTERLOOP/Capital Beltway/ toward Alexandria. Take the I-295 N/National Harbor exit, EXIT 2A-B, toward Washington. Keep right to take DC-295 N toward US-50 E (crossing into Maryland). Take the exit toward MD-410/Hyattsville/New Carrollton. Take left onto Riverdale Rd (Riverdale Rd becomes East-West Hwy/MD-410 W). Turn left onto River Rd. Take the 1st right onto University Research Ct. The NCWCP will be the building on the left. From Washington DC: Take I-295 North to MD- 410/Hyattsville/New Carrollton. 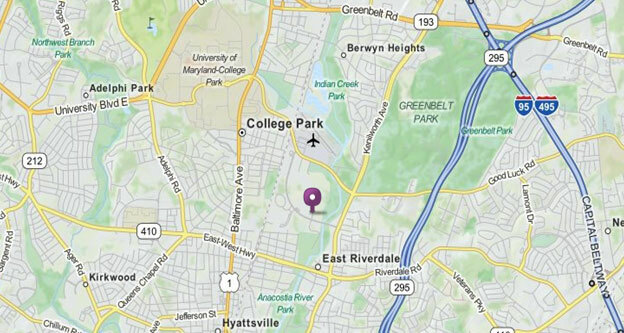 Take left onto Riverdale Rd (Riverdale Rd becomes East-West Hwy/MD-410 W). Turn left onto River Rd. Take the 1st right onto University Research Ct. The NCWCP will be the building on the left. Metro: The NCWCP is also accessible by taking the Green or Yellow Metrorail Line to the College Park/University of Maryland station. It is a 20-minute walk (to the east down River Road) from the station to the NCWCP. Public parking is also availabe at College Park metro. Additionally, a shuttle is available between the metro and NCWCP (M-Square stop) at peak commuting times. More information with schedule and map can be found here. Visitors to NCWCP must show a valid Government ID at the front gate/vehicle entrance, even if entering on foot. Parking is available in the parking garage with issued parking pass, which is required if you do not already have access to NCWCP. If you need a parking pass, inform that guard at the gate that you are here to attend the NOAA AI Workshop. We are limited to 100 parking passes, on a first-come, first-serve basis. If you need to park at NCWCP, you will need to request a parking permit. To request a parking permit please send an email to Stacy.Bunin@noaa.gov with CC to narges.shahroudi@noaa.gov by April 19 and your permit will be sent to you. Please park on the 4th/5th floor of the garage. Parking in the lots across the street from NCWCP is at your discretion. Using public transportation, carpooling, or parking at the College Park Metro Station is strongly encouraged due to the large volume of workshop attendees. To access the Conference Center and Auditorium, proceed through the NCWCP main entrance and through the first doors on the right (not through security). Foreign Nationals, please check in at the Guard Desk.